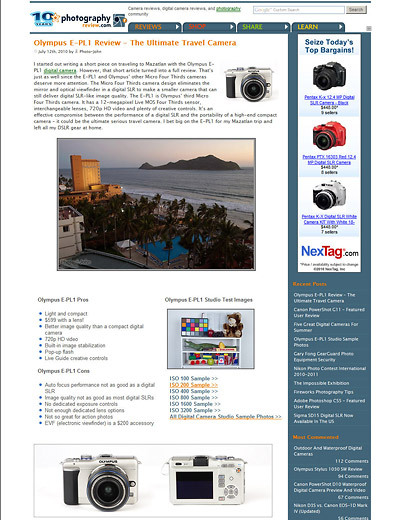 My Mazatlan / E-PL1 travel story turned into a full-blown review and it's now available for your reading pleasure! Let me know what you think of the review. I've made some changes to the format. If you notice anything new you like, I'd like to know. Likewise, if you notice any glaring omissions, I'd like feedback on those, too. You can comment here or in the comments section at the end of the review. And as always, if you own an Olympus E-PL1 - or any other Micro Four Thirds camera - please write your own camera review! Wonder if the prices on these will drop by Christmas? That's a good question, Gregg. The camera companies often introduce new stuff right before Christmas that can bring prices down. I don't see that happening for the E-PL1, though. It's possible they'll lower it just to move units during the Holidays, though. Hello Photo John! I have read quite a few of your reviews and comments on the site. Grateful for your effort! Now, on to why I'm here. I am in a strange situation right now, and I tried to band-aid the problem with an E-PL1. However, I'm actually disappointed with this camera. I think I'm going to take it back. PL1 does not meet my needs at all. It takes beautiful shots of things that are perfectly still, but anything moving even slightly is completely blurred. I found that it doesn't even capture entire faces in focus, because of the slight movements my kids are making while they are sitting still. It does offer way more control than a point and shoot camera, which is nice. It has a great adjustment feature that changes the image for different types of artificial lighting. Maybe using these settings is the reason why all my photos lacked any kind of clarity. I'm not sure, but the photos were terrible! The guy from DigitalRev reviewed this one as a great camera for carrying around for street photos. I agree. I guess if I were to buy another EVIL camera, I'd go with a newer model like a PL3 or Nikon V1. It makes me understand why Olympus released new models so quickly. I forgot to say that I got the PL1 body with two lenses for $399. Sounds like you got a great deal on your E-PL1! Good job on that. Littlechief, I assume you are using this in automatic mode. If so, the maximum ISO by default is only 800, you can override this to 1600 which should provide for faster shutter speed. This should mittigate the frequency of this occurance, but not completely remove. Another thing you can do is try to compose the image as wide an angle as possible, the lens is much faster at the wide angle than all the way zoomed in. The best idea, of course, would be to get a fast fixed lens. It will automatically improve your photography lol, just by having so much more potential in the lens. There is a 45mm f/1.8 lens available for the micro four thirds mount which will improve the low-light capability of the camera exponentially. Changing cameras does nothing for you, as you are running into a problem you will have on all cameras until you change your technique. *edit - What mode is the IS in? If its turned off, turn it on and apply a 50mm focal range, mode 1. This should give you sharper photos with slower shutter speed.